For the majority of the UK, Spain is the favoured overseas travel destination. But where does the rest of Europe head for a well-deserved break? 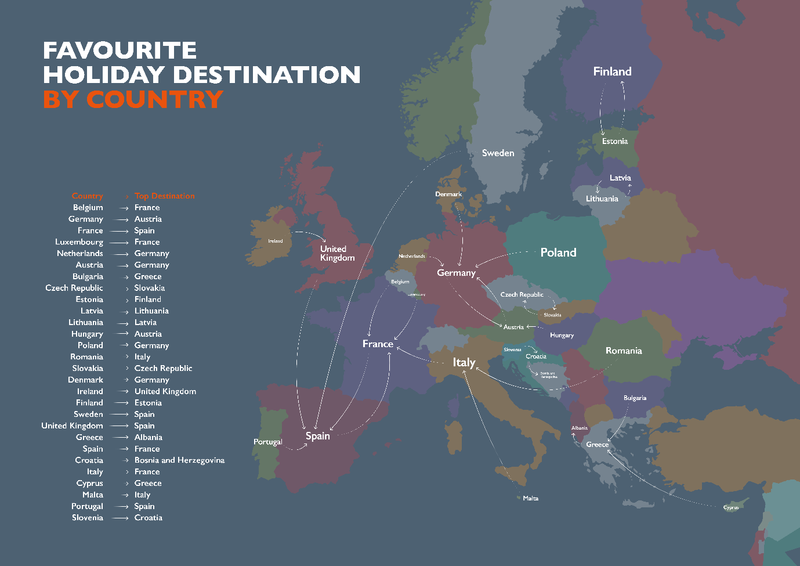 We've mapped out the most popular holiday destination by country using data from the World Tourism Organisation. France, Spain and Germany share the title of most favoured holiday destinations by European citizens, with 4 countries citing them as the place they visit most for a holiday. It is safe to suggest that as a collective, countries tend to favour destinations that are close to them. For example, Germany heads to Austria for its holiday and Luxembourg visits France. Spain is the UK's most popular holiday destination, with a large percentage of Brits planning a trip every year. Unfortunately, the UK was only the most popular destination for just one other country; Ireland. When we analyse popularity in terms of arrivals, the results differ. Arrival figures suggest that France is the still the most popular European country to visit. In 2015 there were 84,452,000 inbound visits recorded in France, nearly 24% more than Spain, the country with the second highest number of arrivals. Despite not being named as a favoured destination by many other countries, the UK does feature in the top 5 for arrival volume. While France has significantly higher numbers of arrivals, it does not top the table when it comes to continued growth. Arrival figures from 2010-2015, show a rise in the number of people visiting eastern European countries such as Latvia, Slovenia and Croatia. Greece saw a substantial increase in the number of arrivals which is most likely due to international tourists taking advantage of Greece's financial crisis. It is not yet known how the country fared in 2016 in regards to tourism. On the other end of the scale, the number of arrivals in France continued to grow from 2010-2015 but saw the smallest increase of all European countries. The UK's economy relies on tourism. With so much to see in Britain, we attract a healthy number of visitors every year. So which nationalities visit the UK the most? 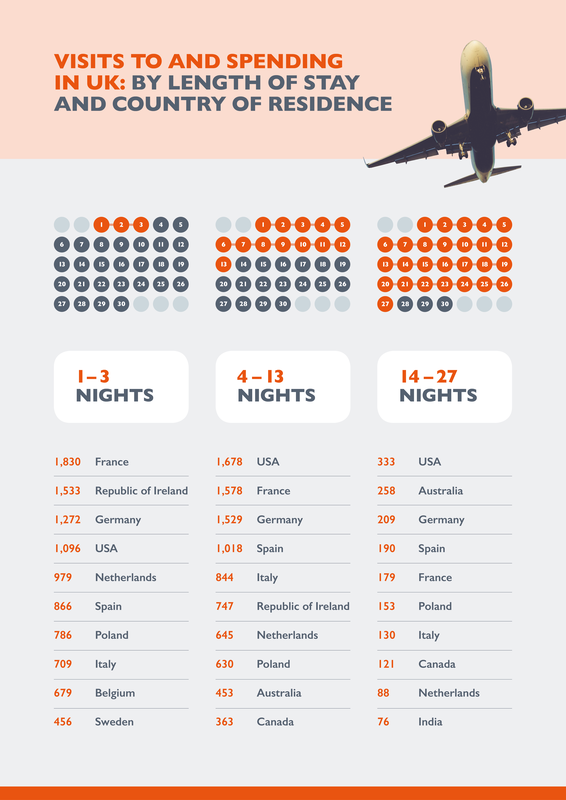 Official data gathered by the Office for National Statistics categorises the nationalities of visitors to the UK by the number of nights they stay. France, Germany and Ireland are the top 3 countries most likely to visit the UK for a long weekend. The USA tops the list of the countries who are most likely to visit the UK for 4-13 nights. The USA is closely followed by France and Germany. The USA also tops the list for longer visits, ranging from 14-27 nights. Australia comes a close second. Germany is the third most popular country that is likely to take a long trip to the UK. So which areas of the UK are tourist hot-spots for international visitors? 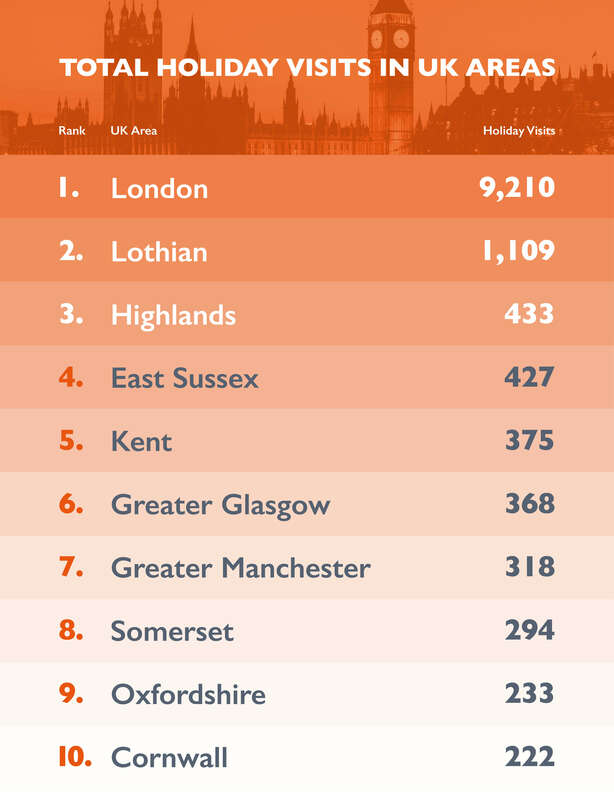 Unsurprisingly London tops the most visited list with an estimated 9210,000 visits made every year. Edinburgh, located in the Lothians, fared very well in second place closely followed by the Scottish Highlands. On the other end of the scale, Tees Valley, East Yorkshire and Kingston upon Hull had the least number of recorded visits. All featured statistics have been taken from professional organisations that have made data accessible to the public. Data has been collated from http://www.worldbank.org/ , http://ec.europa.eu/eurostat/statistics-explained/... and https://www.ons.gov.uk/peoplepopulationandcommunit... .